When you think of tie dye, what is the first thought that comes to you. For some people, tie-dye reminds them of the 60s, a piece that has been rebirth from decade to decade. A vibrant pattern with color that exudes this feeling of love, peace and harmony. For me, tie-dye is one of those pieces that I’ve enjoyed since I was younger and still do today. It’s one of those pieces when I know a good day awaits, I throw it on because it’s fun. My first tie-dye shirt, I made in my home economics class. I remember the process of making the tie-dye shirt to be simple and inexpensive. After all, to make a tie-dye shirt, all you need is the piece you want to dye and the dye. To see major brands like Prada selling tie-dye pieces for thousand of dollars always shocks me given the simplicity of the making process. 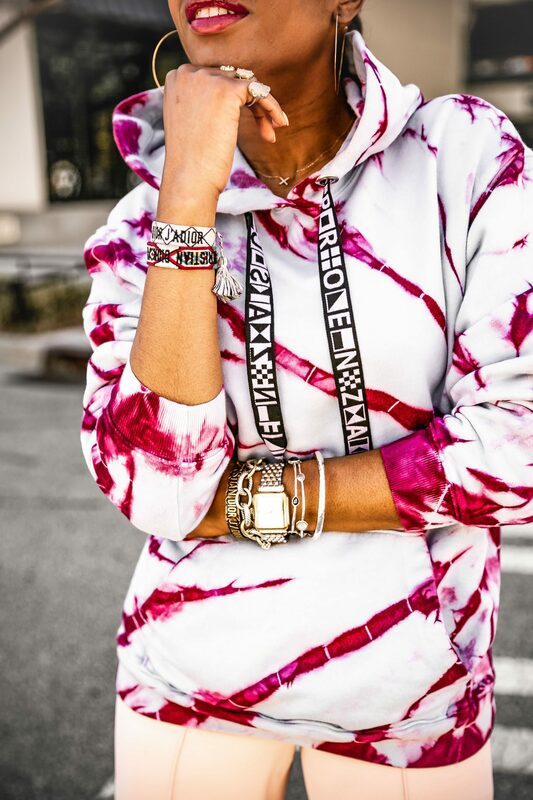 Reality is tie-dye is one of those trends that isn’t going away, as fashion evolves so does the style of tie-dye. As someone who has a love for tie-dye, I’m happy to see it being a major trend this season. 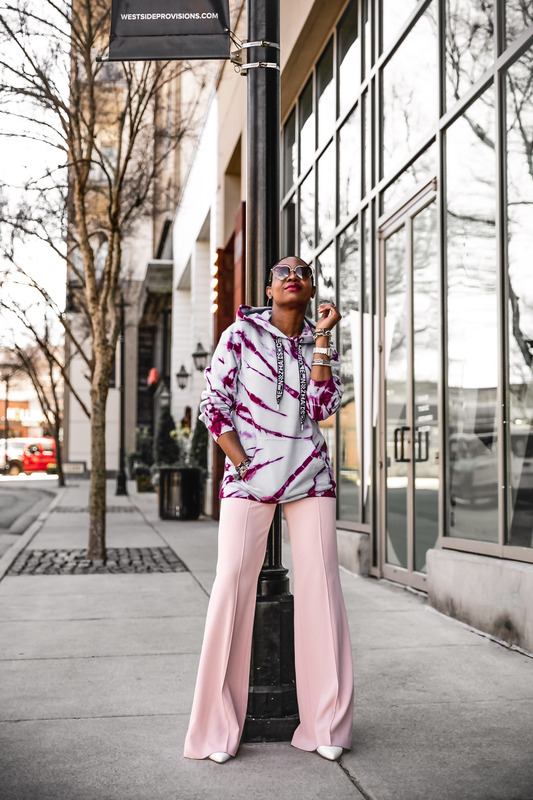 The tie-dye print lends more to a boho vibe, however here a few tips on how to elevate this casual trend and make the look chic. By introducing three key items to my outfit, I was able to transform the look from boho-casual to street-chic. I paired the hoodie with this particular pair of pants for two reasons. The first and most obvious is color. The second reason is the silhouette of the pants. A pair of high-waist pants are extremely classic. They do a great job of elevating any thing they are paired with, and this look is no exception. Nothing screams chic like a pair of white pumps. This pair by Manolo Blahnik is simply gorgeous, and compliments the wearer regardless of shoe size. 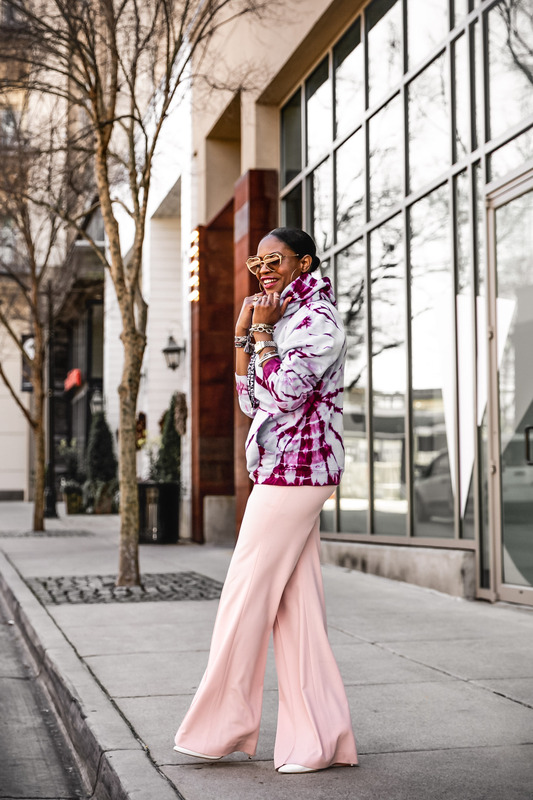 White pumps add an instant polish look to your outfit of the day, making them a great option to pair with any outfit you are trying to dress-up. Accessories are key! Your accessories assist in directing your outfit of the day. Layering jewelry always adds a cool factor. They are my accessory of choice when I want to add a stylish cool-girl factor to my look of the day. Final words, See, pulling off this trend is easier than you think. 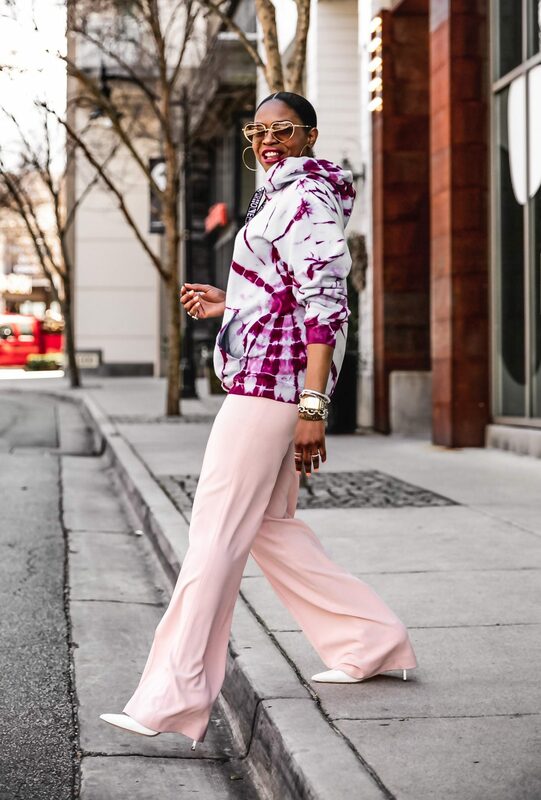 By simply pairing you tie-dye with sophisticated pieces, you instantly create the perfect street-chic outfit of the day!